Aqua Allison Island Miami Beach Condos for Sale. Private Island Miami Beach Waterfront Condos presented by Miami Condo Realty. Unit Sizes: 1316 to 6568 sq. ft.
AQUA Allison Island is a Modernist neighborhood on a 8.5 acre private island in Miami Beach comprising of 3 midrise, waterfront condominiums (The Gorlin, The Chatham and The Spear) and 46 island homes. AQUA represents an equal balance of luxury and sophistication and promises a tropical lifestyle unparalleled in all of South Florida. AQUA is completely surrounded by water and is defined by its colorful combination of modernist archtecture, pedestrian friendly streets and unmatched public amenities. AQUA is an intimate and protected private-community which only a select few can call home. MiamiLoftsandCondos.com - a website of Samir Patel, Broker of Patel Real Estate, Inc.
MiamiLoftsandCondos.com is a website of Samir Patel, Broker of Patel Real Estate, Inc. a Florida Licensed Real Estate Brokerage based in South Florida. 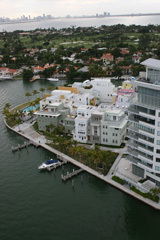 We offer professional services to buyers and sellers of luxury waterfront condominium properties in Downtown Miami, Miami Beach, South Beach, Bal Harbour, Sunny Isles Beach, Coral Gables and Coconut Grove.